Thoughts from Brahma Kumaris: To receive respect from others comes more with responsibility than as a right. Projection: The one who gets respect is the one who becomes worthy of it rather than the one who just expects it. True respect comes from how well a task is done rather than what is done. The more one's specialty is expressed, the more one becomes worthy of respect. Solution: When I go on giving my best in whatever is expected of me, I will start receiving respect from those around me. I will then never expect from others but will naturally be able to give respect to all. This further makes me earn their love and regard. In yesterday's message, we had looked at the incorrect and negative side of respect (the energy of fear) in relationships. Today we look at this kind of relationship from that person's perspective from whom respect is demanded. 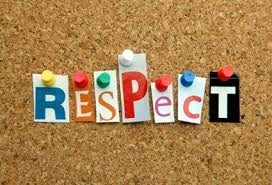 When the boss or the parent or the spouse (please refer to yesterday's message) tries to induce respect inside you for him or her, in return you fear him or her, most of the time thinking it is respect. But, at that point, you need to remember it is impossible to give respect to another if we, at the back of our own minds, fear them. If you are scared of someone or something, it means there is an absence of self -respect, there is a lack of a true realization of your own value, your specialties, your skills and the virtues and powers that you possess. And if you do not respect yourself, you cannot truly respect another. It is only when you are firmly established in your own self-respect that you have no fear of others and are then capable of giving genuine respect to others. Sometimes we are not comfortable with being seen as fearful, because our image will take a beating, so we try to avoid admitting we fear someone by saying we respect them, but internally we are in awe of that person and being in awe is not respecting him or her. Many a times, two prominent people e.g. two actors or politicians or sportsmen are not on good terms. They accuse and bring down each other publicly and are known enemies in the press. While they do that, they also carry a subtle fear of each other, a fear that the other will outperform them; the other will be more popular, the other will be more powerful etc. This normally happens because of a lack of self-respect. They both will probably hide that and will pretend that they are confident and established in their self-respect. But if their self-respect were genuine, they would not be scared of each other, and they would have the courage and the patience to talk and work with each other and listen to and offer the hand of friendship to each other, whom they perceive to be an enemy. But when they don't have the strength of their own self-respect and when they are unaware of their lack of self-respect, subtle fear for the other creeps in, which they don't realize and if they realize, they do not admit the same. And that's why the restoration of self-respect is only possible when the ego is recognized and no longer nourished. Because, fear always comes from the ego and ego is nothing but an excessive attachment to one's false image.